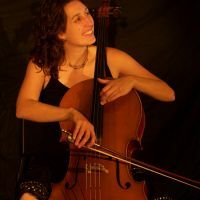 Additional Info: In the classical world, Rebecca is a respected cellist who is a member of the Oakland East-Bay Symphony and the Santa Rosa Symphony. She has also performed with the Women's Philharmonic Orchestra, Modesto Symphony, Monterey Symphony, San Francisco Ballet Orchestra, Santa Cruz Symphony, and Vallejo Symphony. Rebecca has soloed with the Cal State Hayward Orchestra, the Marin Chamber Orchestra, the Ohlone College Orchestra, the Classical Philharmonic, and the Women's Community Orchestra. As part of her classical adventures, Rebecca has toured Europe and Brazil, backed up Issac Hayes, and been in an Acura car commerical. She has performed and recorded with numerous rock bands, singer-songwriters, heavy metal bands, Americana bands, and others. In the world of rock n roll, jazz, world, and folk music, Rebecca has taken her strong skills on the cello to an even higher level performing with an amazing assortment of bands. These include (but are not limited to) Juliette Commagere at the Great American Music Hall (opening for Ry Cooder and Elvis Costello), with the Danny Click band opening for JJ Cale, backing up Melissa Manchester, and a performance at Oakland's Fox Theatre of video game music for the Video Game Live World Tour. Rebecca currently performs regularly with Electrika, an electric gypsy rock band; Tango Ritmico, an Argentinean tango ensemble, Jonathan Levi Band, an Indie Band, Whitney Nichole, a singer-songwriter, and Rouge Band, a classical/crossover band with a heavy metal influence.